Effective kitchen design is the process of combining layout, surfaces, & appliances to create a gorgeous cooking space that’s super easy to use. 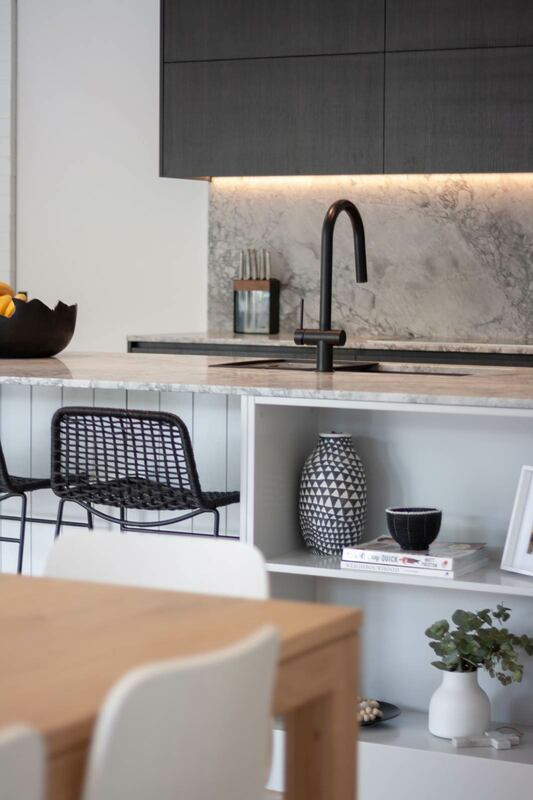 A great kitchen designer will always look at function first, then arrange a beautiful palette of modern aesthetics for a visually pleasing & effortless user experience. Here’s a few things that we consider most important when designing a new kitchen. 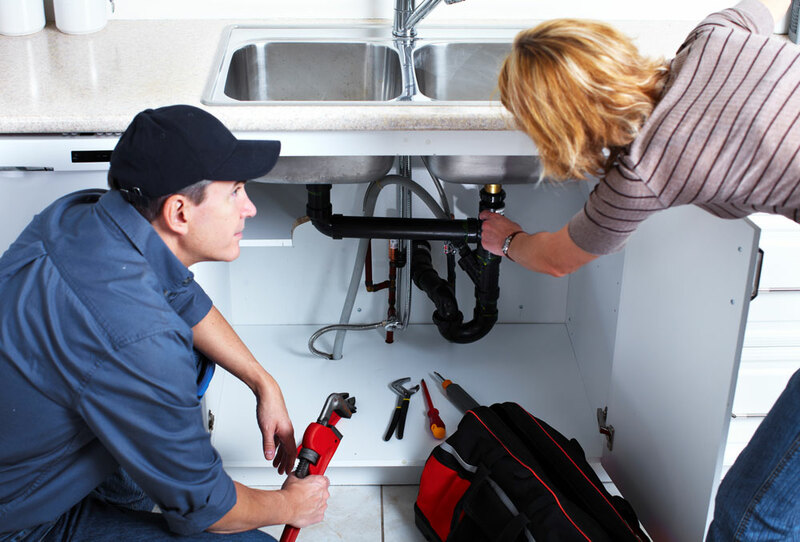 Depending on your budget you may wish to leave the existing gas or plumbing lines where they are to save on relocation costs. If though, the current locations are not practical or won’t allow for your desired layout it’s best to relocate them. You won’t regret the extra expense once your new kitchen has been installed and you are using it 3 or more times a day. Next we find out what what you love / hate about your current kitchen. If something is already working well, it’s worth keeping or else you may end up later wishing you did. On the contrary, whatever bugs you the most about your current kitchen design – let’s get rid of it so you never have to deal with it again. What new features would you like to see in the design? There may be something you’ve always had on the wish list for your dream kitchen. This is your chance to make it a reality. Let your designer know about it early on so they can prioritise and work it into the kitchen design. Most likely you’ve already heard of something called the ‘kitchen work triangle’ which focuses on 3 primary work areas (sink/fridge/cooktop). 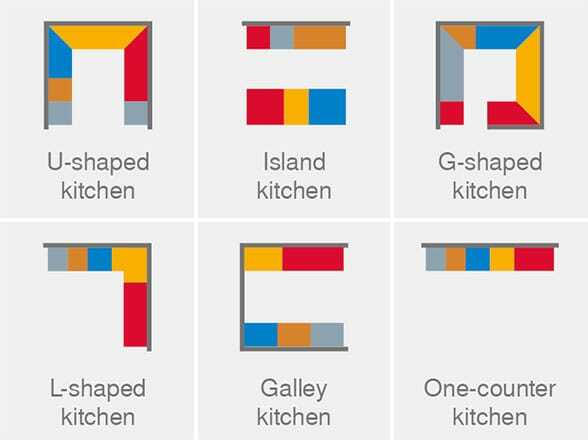 This primitive method of kitchen design suggested that by arranging those three areas separately with appropriate spacing between them, the kitchen would function at its best. The kitchen work triangle is an idea that has been around for a very long time but is now considered obsolete as better ideas have evolved. Today the most efficient and widely followed kitchen workflow design method is Dynamic Space®, presented by international company Blum who are the world’s leading manufacturer of superior quality cabinet hardware. Blum’s approach to kitchen design is far more practical in today’s modern world, dividing kitchens into 5 different work areas or ‘zones’ to cater for common, everyday tasks. This shortens distances and allows you to keep everything exactly where you need it to avoid bumping into other users that may be performing other tasks at the same time. Every kitchen can be divided into these five work zones – regardless of size or shape. For right-handed people, the zones are arranged clockwise. If you’re left-handed, it’s the other way around. This method also makes it easier when you have more than one person in the kitchen performing different tasks. One can be cooking while another is cleaning and stacking the dishwasher. Separating the zones in this way makes them accessible for everyone and avoids those frustrating traffic jams during peak hour in the kitchen. The value of appropriate spacing should never be underestimated as it can make a big difference to the look & function of the kitchen design. 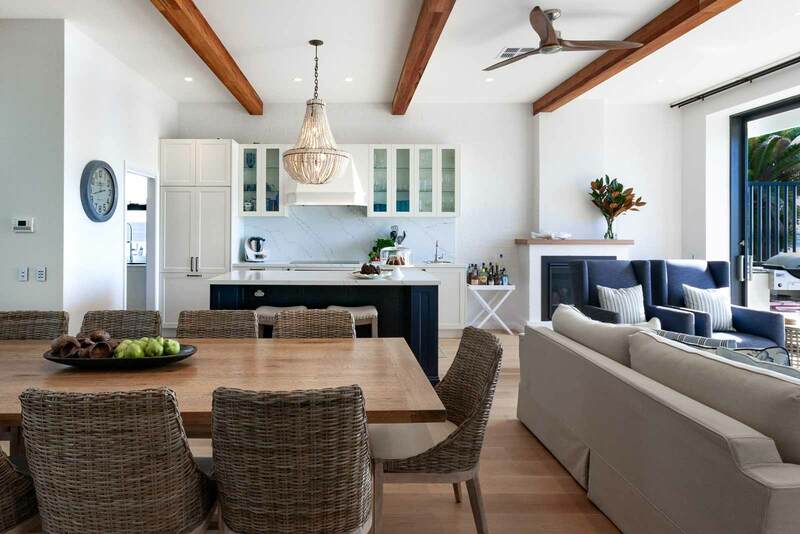 Too little space between the main benchtop and the island can cause the space to feel cramped, while too much can result in an inefficient workflow and wasted steps. This kind of oversight cannot be easily corrected once the kitchen has been installed, so it’s important to get it right from the start. By carefully considering the distances between each work zone, we can maximise the use of total space and ensure the most comfortable work area for the user. Your kitchen designer will help you plan the most appropriate spacing around areas and items to suit your layout. A great kitchen design will usually feature 3 different types of lighting for varying purposes. Your kitchen designer will help you illuminate your kitchen in all the right places. A little controversial, you will either love this idea or hate it. However, if it does appeal to you it can increase design options in terms of improving workflow and allowing more flexibility with the location of appliances. There are pros and cons to both options here. A wall oven is more comfortable to use when cooking but reduces available bench space. An underbench is the opposite, providing more bench space above but less conveniently positioned. Your choice here will revolve around your cooking preferences and how big or small your kitchen space is. Integrated appliances are ideal as they provide a seamless look to the kitchen design but they do cost more to install. Depending on your budget you may wish to forego this option. For freestanding fridges in particular, whilst there are a lot of nice looking models available in different colours and finishes, there’s a few things you should know. 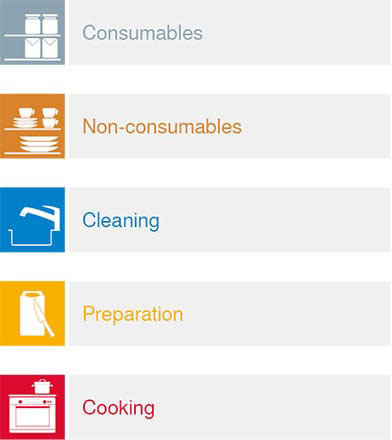 Around the edges of the fridge, there will be some spacing – specific cabinet clearances for ventilation that we must adhere to according to the manufacturer’s warranty guidelines. Failure to do so may result in a void of warranty. Freestanding fridges will never sit flush with the cabinets at the front as there needs to be enough room for the hinged door to open fully without hitting the adjacent cabinets. Most people are not aware of these details and as it may result in an undesired finish, it’s best to think about it ahead of time and be prepared for how it will look. Integrated fridges still require ventilation but it’s much more discreet with a simple vent built into the cabinets above or below. A lot of the time our customers are not really sure what they want in terms of style and some find it even more difficult to visualise different colours and finishes together. 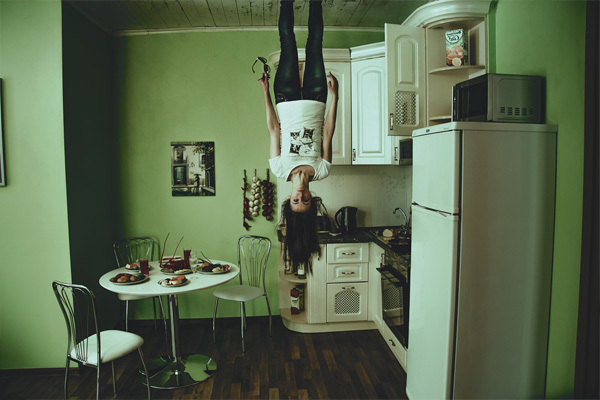 This is totally normal and it’s what gives our kitchen designers an opportunity to shine. 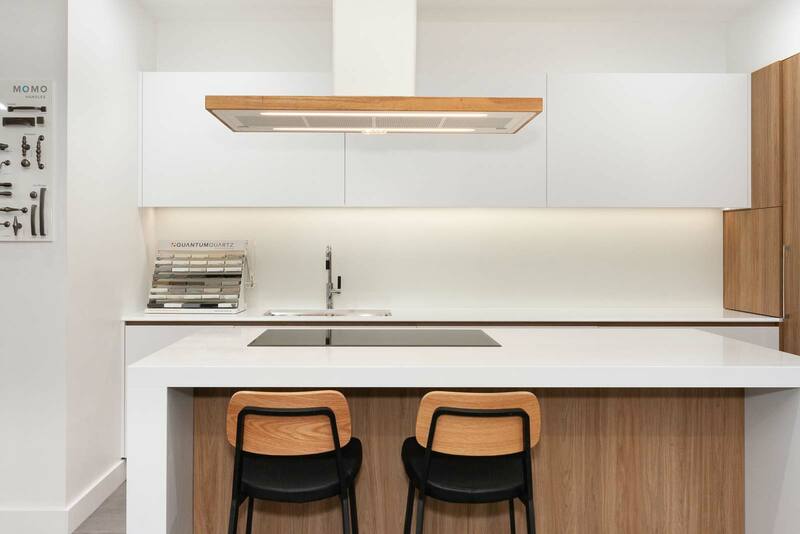 We usually ask prior to your initial consultation that you collect some images of other kitchens you like from instagram, pintrest or any kitchen design magazine from your local newsagency. 6 images or so is all we need to find the common theme in your preferences and put a palette together for you that we know you’ll love. 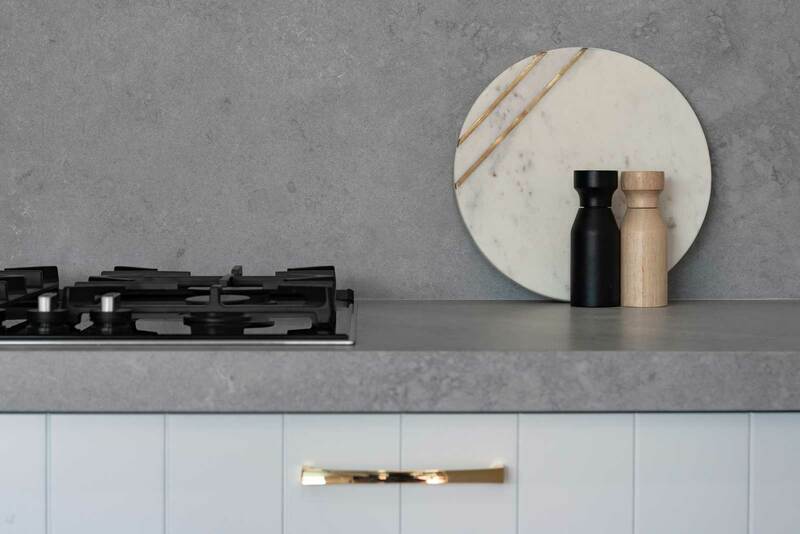 We love combining different materials and finishes to create a designer look in the kitchen. 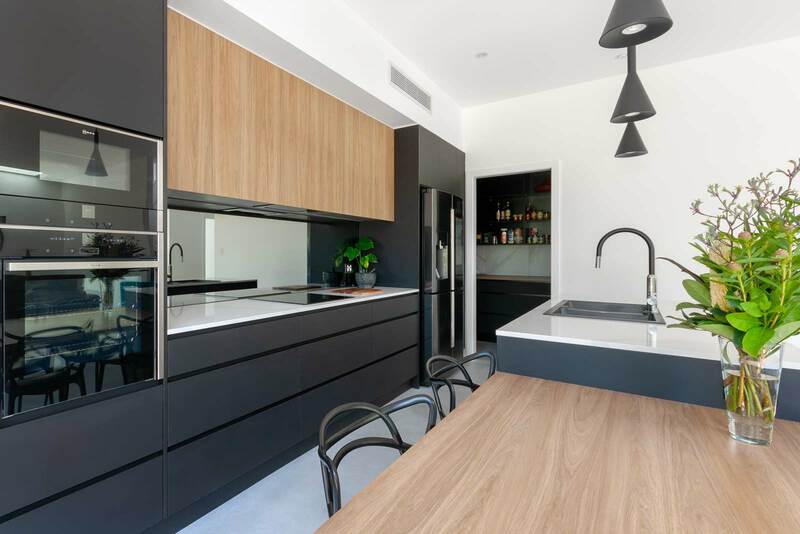 Two tone kitchens that combine dark or light cabinets with a subtle contrast such as timber grain is our favourite combo. 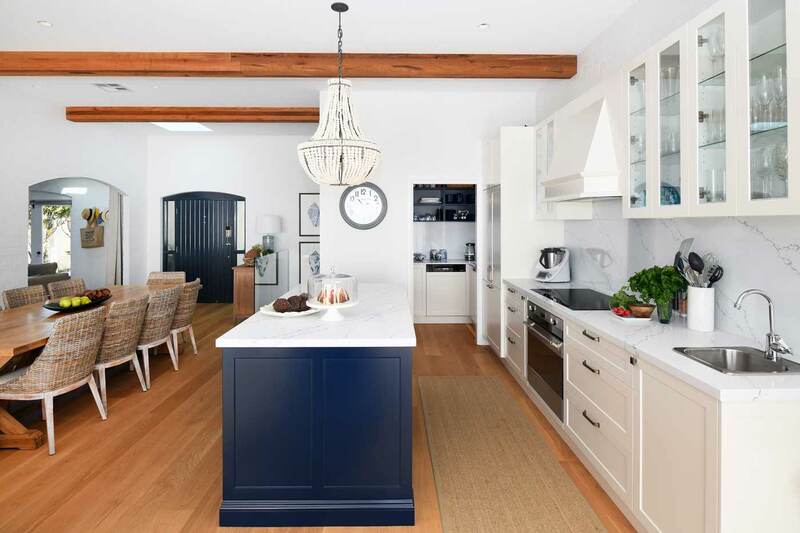 A typical misconception amongst home renovators and property investors is that the only way to increase resale value and avoid it dating over time is to choose all white finishes. Whilst white kitchens appeal to the majority of audiences and are likely to remain timeless, they can often look … well, a bit boring. 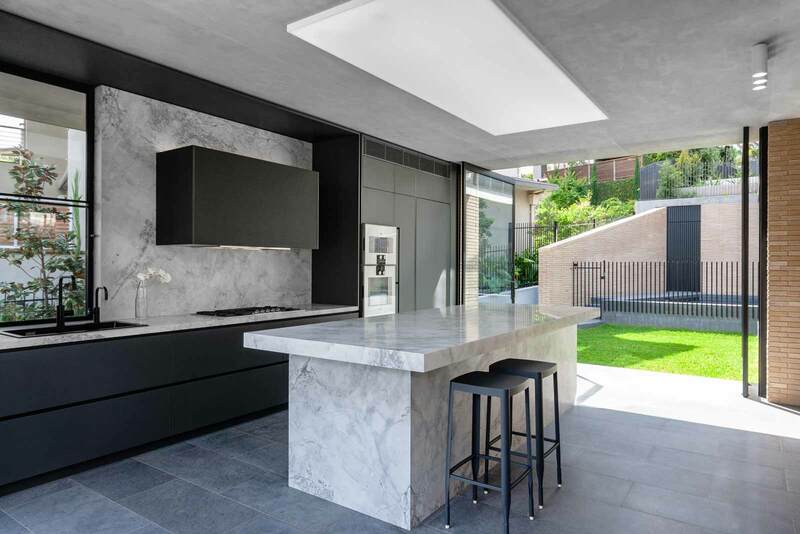 Conversely, to avoid a boring kitchen you might think you have to choose high contrast or brightly coloured cabinetry but this is not the case either. For an aesthetically pleasing kitchen design that’s less ‘blah’ and more ‘ah-ha’ … what you really want, is texture. Texture draws us into the detail and inspires us to interact, touch & feel. Using texture in the right doses can transform a plain or monotone palette into a luxurious, chic & inviting space. It also allows you to have an all-white kitchen that’s unique and interesting instead of cold and clinical. One of the most common mistakes people make is to design the kitchen without any consideration for the spaces adjoining the kitchen. Although the kitchen by itself might look fantastic, if it is lacking visual consistency with the rest of the home it can end up looking like it doesn’t really belong there. What style is the rest of the home and in particular, the rooms nearest to the kitchen? What colours / textures have already been used? By bringing some of those elements into the kitchen design we can create harmony in the overall look and feel of the space, making the whole area more balanced & well thought out.